I wish everyone in the USA a very Happy 4th of July! Since most of my outings are on the weekend I am sharing some various scenes. One is on the way to my son's place and from my son's backyard, my moon shot from my deck & yard and hubby is sharing his sunset shot at our lake. It is a hodge podge of photos for Tex's Good Fences and for Skywatch Friday! We pass this farm and barn every time we visit my sister and now when we visit my son's new place..I have always loved this barn.. So, I just had to pull over and get a shot. 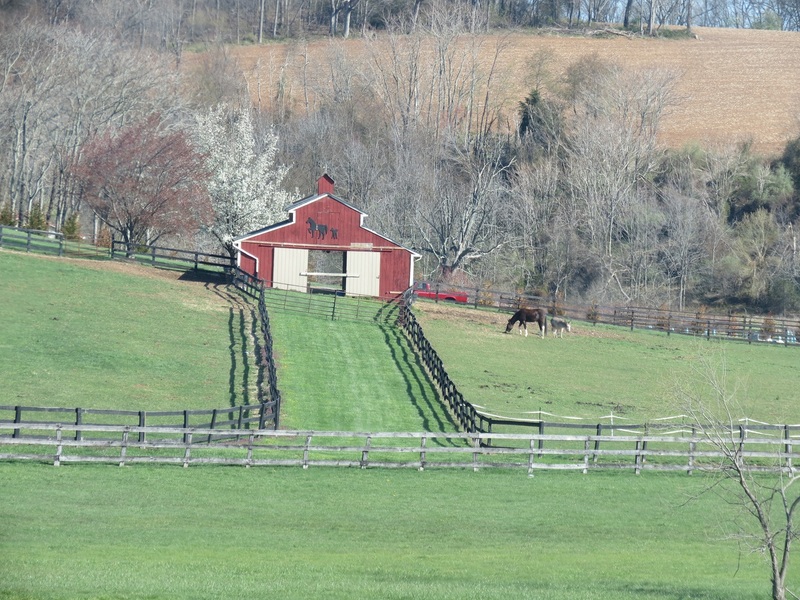 It is perfect also for Tex's Good Fences..
A closer look at my favorite barn, a cute horse and donkey.. The fence scene in my son's backyard with his pretty white dogwood..The previous owner was a older lady that loved to garden.. I hope my son takes care of all her pretty plants.. I am pretty sure that this is a Great-Crested Flycatcher in my weeping cherry tree. I can only say that because of the sounds I was hearing from this bird. The Flycatcher can be tricky to me. 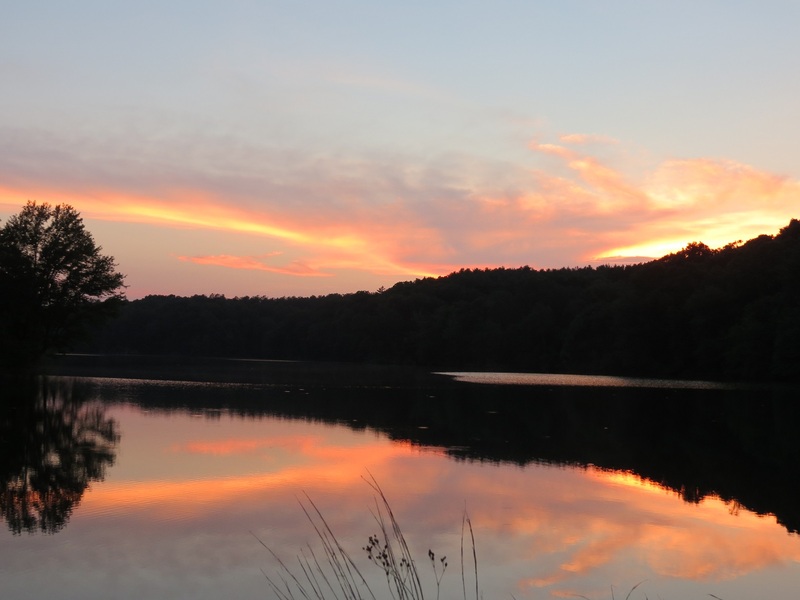 And this is hubby favorite place to watch the sunset at our lake..A pretty sky and a beautiful reflection. Hubby is becoming a great photographer.. I hope you enjoyed my post and photos from our weekend walk.. Thanks to Tex @ The Run*A*Round Ranch for hosting Good Fences and to Sylvia, Yogi and Sandy for hosting Skywatch Friday! I wish everyone a safe and happy long weekend. The dogwood tree is gorgeous and reminds me of the one we had in South Africa we used to call the "butterfly tree"! Don't the flowers look like butterflies perched at the tip of the branches?! Your son is lucky to live in this beautful area! beaut' photos every one Eileen. I enjoyed the barn location very much; the beautiful dogwood in your son's garden, your hubby's sunset photograph; well done all. That is one pretty farm--love the barn, it caught my eye right away. Have a good weekend, Eileen. We're supposed to have PERFECT weather. Hopefully the mosquitoes will be to busy grilling out and entertaining friends to notice me out in the garden-LOL! You do live in a great spot, Eileen, even when it snows! I hope your son looks after the garden too. What a nice selection of images! 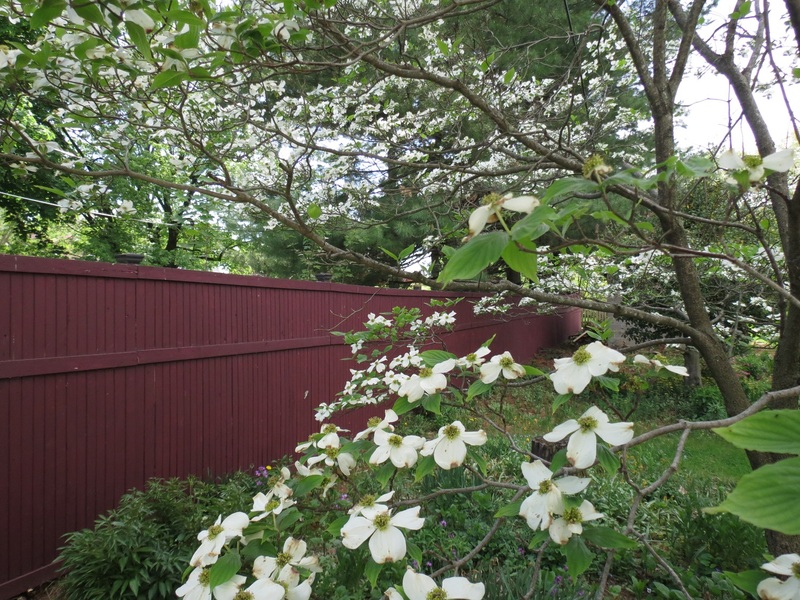 That flowering dogwood against the deep red fence is beautiful! That is a beautiful farm. 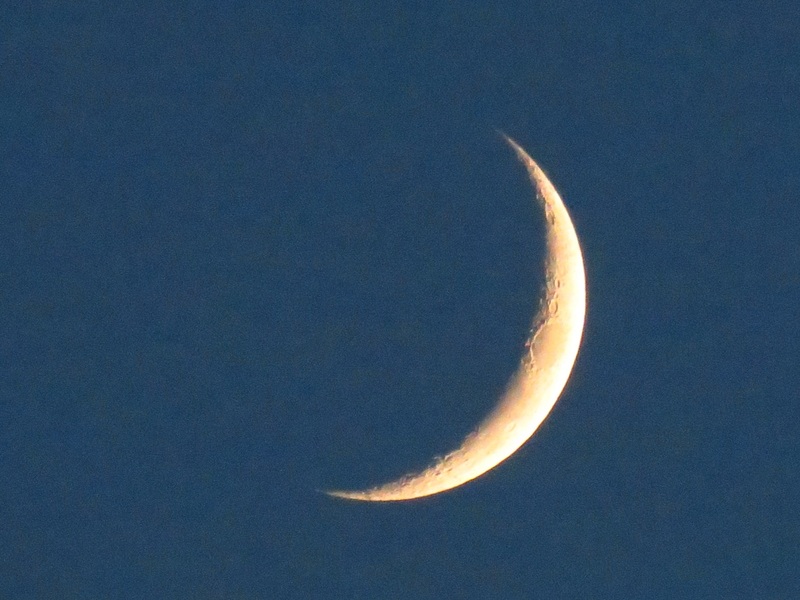 Beautiful crescent moon, and wow on the sunset! All lovely shots, Eileen! Love the farm with it's many fences! congrats to your son! lovely yard! just a beautiful horse farm! wow! thanks for linking that! enjoy your holiday, too! Hi Eileen. I can see why you 'like the barn and it's surrounding area. Love you son's. Garden and flowers and also the bird. Yes hubby is good at taking sunsets. Love the 2nd fence image...and that sky shot is absolutely breathtaking!!! I can't imagine how much time it took to put up all of that fencing. wonderful images Eileen. Love the first and last ones. I can see why its your favorite barn. Hi Elaine... Oh that's a gorgeous shot of the crescent moon !! Love the nice barn set up and the fences, very neat looking place!! what a GREAT collection of images!! pretty fences, an awesome sunset and i love the cresent moon!! have a nice, long weekend!!! Your lake shot is spectacular! A good hodge podge Eileen! :) Love that huge cresent moon shot,the farm and the beautiful Dogwood.Last but not least your hubbie's sunset is superb, what a gorgeous place. what a super moon shot and fabulous sunset. When I see those endless miles of fence I can't help think of the upkeep, it is probably endless. I love the moon, and the sunset is amazing. Beautiful pictures. Love the sunset especially...just gorgeous. Beautiful shots, Eileen! I love the fence on that pretty farm, the moon shot is fabulous and so is your husband's shot of the sunset! A nice collection of photos! Love the red barn. Your moon shot is great. And the sunset is divine. Dogwood, one of my friend's favourites down here, and the sunset, beautiful reflection. Cheers,Jean. Great post! !What a lovely farm!Beautiful view! !Great shots of the farm the moon and your hubby's sunset! !What an amazing reflection!! Beautiful skies and 'heavenly' captures!! Thanks as always for sharing the beauty, Eileen!! Happy 4th of July! Have a great weekend!! I love all your photos! You showed so beautiful place ! l love sunset pics and your husband's shot is gorgeous,Eileen! Happy 4th of July to you and your family! Hugs!! The barn scene is lovely. Hi There, Just stopping by to say "Happy 4th of July".... Hope you have an incredible weekend whether you are traveling, with family or friends --or like us, just enjoying being home! We hope to grill a couple of steaks tomorrow. Our weather here is awesome right now...God Bless American --and God Bless YOU. Great photos.. I too love that barn... WOW--gorgeous. I also love the moon photo and the sunset... WOW!! This post may contain a hodge podge of pictures, but they are all beautiful. I hope you and your family have a happy and safe Fourth of July weekend. Beautiful post, Eileen! LOVE the barn and fences, and that last photo is fabulous! 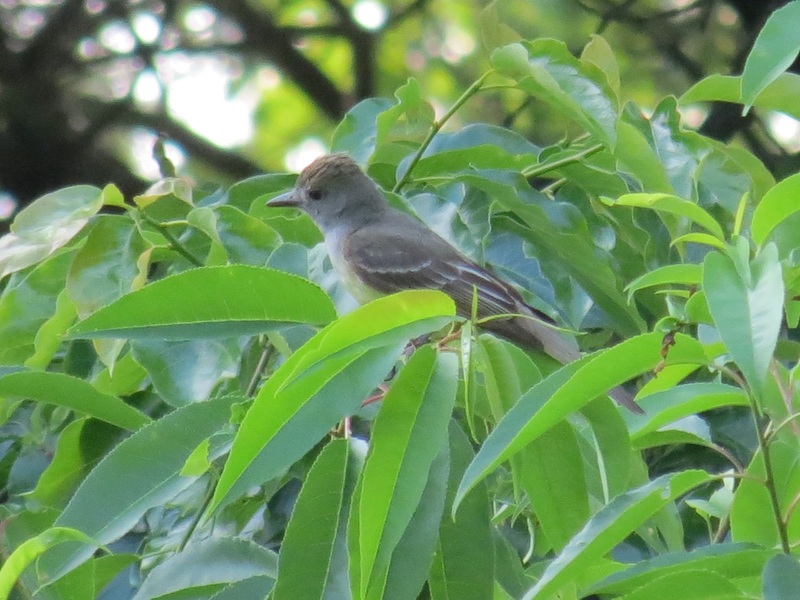 Hi Eileen, thanks so much for your ID on the great crested flycatcher! Love those farm scenes. Beautiful shots. That's a great barn. I love the colorful reflection at the end. Happy 4th tomorrow. I agree Eileen... your hubby's sunset shot is lovely .... capturing the moment. hoping you both have a great week-end with lots of photo ops. All your photos were stunning! But that sunset...WOW! Beautiful farm! And the sunset is gorgeous! your husband found a perfect spot to watch glorious sunset. Your lake is so beautiful. A great series! Gorgeous moon shot as always! Happy 4th of July! What lovely pictures -- beautiful drive, great flowers and the darling bird. And a perfect sunset. I did a double-take when you said 'our son's place'...I thought, what, isn't he just a teenager?. Then I realized how long I've been visiting you! They do grow up don't they (and thank goodness). Your sunset shot left me in awe, as well as the pastoral scene of the barn and fencing. Hope you have a safe and happy 4th! I like Hubby's sky shot... really beautiful!! I thoroughly enjoyed viewing all your photos on this post. The sky is absolutely gorgeous. Lovely barn and glorious sky shot! The moon and sunset over the lake are lovely to see. Great selection of photos -- love the sunset! I feel myself fortunate just to catch sight of one of these flycatchers. To capture one on camera is even more special. A beautiful yard! All photos are wonderful and the sunset really breathtaking! What a blessing to have an established garden. Love that deep-colored fence. Beautiful series, the bird and the moon, the moon, lovely. A great collection of photos. The barn is darn perfect. Beautiful photos . Love crescent moon. In romanian we call it " Crai nou"! :) Happy 4th of July! Wonderful shots, Eileen, the orange feflections are breathtaking. Thanks for sharing and enjoy your weekend. I love looking at your photos Eileen. This is a very pretty series. Happy Fourth of July! Beautiful scenes. love the moon. Happy fourth. I love the appearance of well kept wooden fences and barns. That is indeed a beautiful farm and a lovely sunset. Hope you have a wonderful Fourth! I liked each of your pictures. They are each unique and good examples. Your hubby shot is gorgeous. happy 4th of july, eileen!! Nice set of beautiful scenes- love the dogwood against that pretty red fence- the bird, the barn..all fabulous. Happy 4th of July,dear Eileen!! So much greenery around your place! You are blessed to live in such a beautiful place! Fantastic photos, Eileen! You have some wonderful views in your neck of the woods, and your photos are great! That is a neat barn! And your son's "adopted" dogwood (as well as the fence behind it!) is lovely. That gorgeous crescent moon shot is my favorite - though your husband's photos are starting to give yours a run for their money! :-) Beautiful sunset.. These are great. I love the optical illusion of the rippled fence shadows in the grass. Healing lovely country shots, Eileen! Your hubby's moon shot is wonderful! Oh a fence linky! I used to link up with one, so took lots of fence shots. That person no longer blogs. You have an ideal spot to enjoy the day's end. Such a magnificent sunset!! Such an AMAZING post for its spectacular photos!! 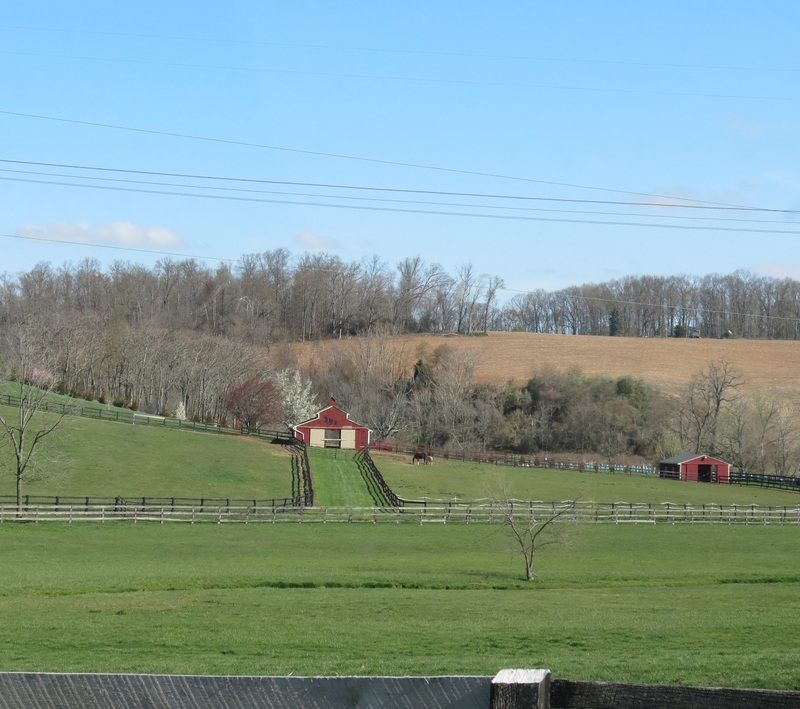 The barn and its surrounding fence, rolling hills and horses could easily be an oil painting! Your son's garden is enchanting; I'm sure he appreciates the work and love that went into it by the previous owner, and your hubby's sunset shots are brilliant!! oh wow that farm house and acres. I love. Oh the rest is magnificent takes. As I wrote. I see a beautiful parrot. Your dogwood is just now coming out??? Your son does have a lovely back yard!! And the sunset is over your lake is lovely! Lovely and stunning, the almost burning lake! a nice looking barn with fences and all.